Scientists have discovered the oldest hominid remains in western Europe. 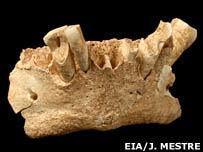 A jawbone and teeth discovered at the famous Atapuerca site in northern Spain have been dated between 1.1 and 1.2 million years old. (BBC). The remains beat the previous record by 500,000 years (El Pais). Stone tools and animal bones were also found with tell-tale cut marks from butchering by humans.